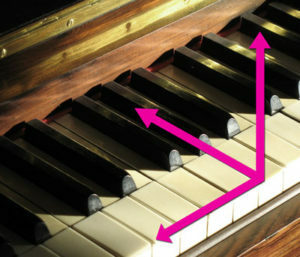 ¿Conoces los beneficios de tocar el piano? Incrementa la autoestima y la autoconfianza. Fomenta la constancia y la disciplina. Estimula el logro de objetivos. Ayuda a vencer algunos miedos. Se adquiere un mayor conocimiento interior. Enseña el valor y la recompensa de la dedicación. Hacer música es una recompensa en sí misma. Aprender a tocar el piano ofrece tanto a niños como adultos la oportunidad de desarrollar una habilidad que enriquecerá sus vidas para siempre. Hyde K.L. et al. (2009). “Musical training shapes structural brain development”. The Journal of Neuroscience 29(10), 3019 –3025. Gaser, C. and Schlaug, G. (2003). “Brain Structures Differ between Musicians and Non-Musicians”. The Journal of Neuroscience, 8 October 2003, 23(27): 9240-9245. Skoe E. and Kraus N. (2012). “A little goes a long way: how the adult brain is shaped by musical training in childhood”. J Neurosci. 32(34):11507-10. Pascual-Leone, A. (2001). “The Brain That Plays Music and Is Changed by It”. Annals of the New York Academy of Sciences 930 (1): 315–329. Jäncke, L. (2009). “Music drives brain plasticity,” F1000 Biology Reports, vol. 1, p. 78. Schlaug, G. (2009). “The Brain of Musicians: A Model for Functional and Structural. Adaptation”. Ann NY Acad Sci 2001 930: 281-299. Schlaug, G., Jancke, L., Huang, Y. X., Staiger, J. F., & Steinmetz, H. (1995). “Increased corpus-callosum size in musicians”. Neuropsychologia, 33, 1047–1055. Schlaug, G., Norton A., Overy K. and Winner E. (2005). “Effects of music training on the child’s brain and cognitive development”. N.Y. Acad. Sci. 1060: 219-230. Ceci, S.J., & Williams, W.M. (1997): “Schooling, intelligence and income”. American Psychologist, 52, 1051-1058. Schellenberg, E. G. (2004). ”Music lessons enhance IQ”. Psychological Science, 15(8), 511-514. Schellenberg, E. G. (2006). “Long-term positive associations between music lessons and IQ”. Journal of Educational Psychology 98(2): 457-468. Schellenberg, E. G. (2011). “Examining the association between music lessons and intelligence”. Br J Psychol. 102(3):283-302. Lesiuk, T. (2005). “The effect of music listening on work performance. 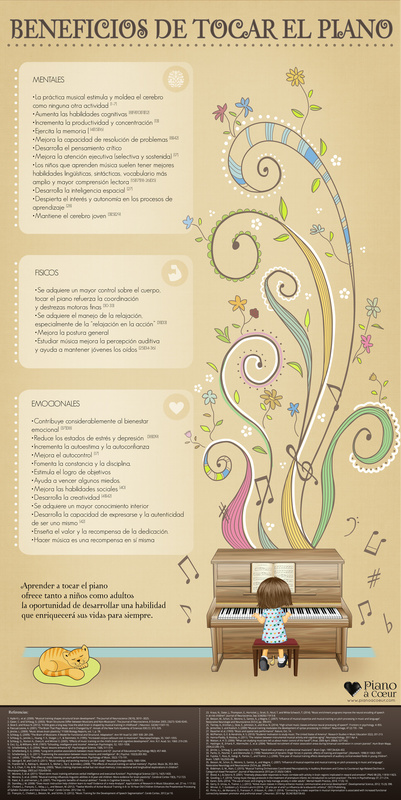 Psychology of Music. 33(2): 173-191. George E. M. and Coch D. (2011). “Music training and working memory: an ERP study”. Neuropsychologia 49(5), 1083-1094. Franklin M. S., Rattray K., Moore K. S., Moher J., Yip C. & Jonides J. (2008). “The effects of musical training on verbal memory”. Music 36, 353–365. S. Chan, Y. Ho, & M. Cheung. (2003). “Music training improves verbal but not visual memory: cross-sectional and longitudinal explorations in children”. Neuropsychology, 2003 Jul;17(3):439-50. Moreno, S. et al. (2011): “Short-term music training enhances verbal intelligence and executive function”. Psychological Science 22(11), 1425-1433. Moreno, S. et al. (2009): “Musical training influences linguistic abilities in 8-year-old children: More evidence for brain plasticity”. Cerebral Cortex 19(3), 712-723. Patel, A. D. and Iversen, J. R. (2007). 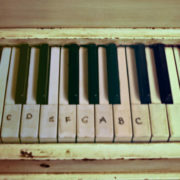 “The linguistic benefits of musical abilities”. Trends in Cognitive Sciences, 11:369-372. Standley, J. M. (2008): “Does music instruction help children learn to read? Evidence of a meta-Analysis”. Applications of Research in Music Education, 27 no. 1 17-32. Chobert, J., François, C., Velay, J. L., and Besson, M. (2012). “Twelve Months of Active Musical Training in 8- to 10-Year-Old Children Enhances the Preattentive Processing of Syllabic Duration and Voice Onset Time”. Cereb Cortex. 2012 Dec 12. François, C., Chobert, J., Besson, M., and Schön, D. (2012). “Music Training for the Development of Speech Segmentation”. Cereb Cortex. 2012 Jul 10. Kraus, N., Slater, J., Thompson, E., Hornickel, J., Strait, D., Nicol, T. and White-Schwoch, T. (2014). “Music enrichment programs improve the neural encoding of speech in at-risk children”. Journal of Neuroscience, Sep 3;34(36):11913-8. Besson, M., Schon, D., Moreno, S., Santos, A., y Magne, C. (2007). “Influence of musical expertise and musical training on pitch processing in music and language”. Restorative Neurologie and Neuroscience 25/3-4, pp. 399-410. Tierney, A., Krizman, J., Skoe, E., Johnston, K., and Krus, N. (2014). “High school music classes enhance neural processing of speech”. Frontiers in psychology. 4: 855. Jentschke, S. and Koelsch, S. (2009) “Musical training modulates the development of syntax processing in children”. Neuroimage, 47 (2) 735 – 744. McPherson, G. E. & Hendricks, K. S. (2010): “Students’ motivation to study music: The United States of America”. Research Studies in Music Education 32(2), 201-213. Hanna-Pladdy, B, Mackay, A. (2011). “The relation between instrumental musical activity and cognitive aging”. Neuropsychology. 2011 Apr 4. Watson, A. H. D. (2006). “What can studying musicians tell us about motor control of the hand?” J Anat. 2006 April; 208(4): 527–542. Haslinger, B., Erhard, P., Altenmuller, E., et al. (2004). “Reduced recruitment of motor association areas during bimanual coordination in concert pianists”. Hum Brain Mapp. 2004;22:206–215. Jäncke, L., Schlaug, G. and Steinmetz, H. (1997). 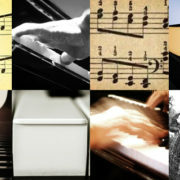 “Hand skill asymmetry in professional musicians”. Brain Cogn. 1997;34:424–432. Parlitz, D., Peschel, T. and Altenmuller, E. (1998) “Assessment of dynamic finger forces in pianists: effects of training and expertise”. J Biomech. 1998;31:1063–1067. Fujioka, T., Ross, B., Kakigi, R,. Pantev, C., and Trainor, L. J. (2006). “One year of musical training affects development of auditory cortical-evoked fields in young children”. 129(Pt 10):2593-608. Besson, M., Schon, D., Moreno, S., Santos, A., and Magne, C. (2007). “Influence of musical expertise and musical training on pitch processing in music and language”. Restorative Neurology and Neuroscience 25/3-4, pp. 399-410. Bidelman, G. M., Alain, C. (2015). “Musical Training Orchestrates Coordinated Neuroplasticity in Auditory Brainstem and Cortex to Counteract Age-Related Declines in Categorical Vowel Perception”. Journal of Neuroscience 2015 Jan 21;35(3):1240-9. Blood, A. J. & Zatorre, R. (2001). “Intensely pleasurable responses to music correlate with activity in brain regions implicated in reward and emotion”. PNAS 98 (20), 11818-11823. Gooding, L. F. (2010): “Using music therapy protocols in the treatment of premature infants: An introduction to current practices”. The Arts in Psychotherapy 37, 211-214. Karen, Eells. (2014). “The use of music and singing to help manage anxiety in older adults”. Mental Health Practice, 2014; 17 (5): 10. Gerry, D. Unrau, A., Trainor, L. J. (2012). “Active music classes in infancy enhance musical, communicative and social development”. Developmental Science, 2012; 15 (3): 398. Winner, E., T. Goldstein y S. Vincent-Lancrin (2014). “¿El arte por el arte? La influencia de la educación artística”. OECD Publishing. Pinho, A.L., de Manzano, Ö., Fransson, P., Eriksson, H., Ullén, F. (2014). “Connecting to create: expertise in musical improvisation is associated with increased functional connectivity between premotor and prefrontal areas“. J Neurosci. 2014 Apr 30;34(18):6156-63.